The White House is looking for ways to help graduates deal with student loans. WASHINGTON (CNNMoney) -- The deadline for Congress to extend the low 3.4% interest rate on student loans is fast approaching. But the Obama administration, eager to make college debt a re-election issue, is looking for a way to lessen the burden on graduates. Last week, the White House rolled out a plan to make it easier for graduates to enroll in a special program that caps loan repayment, based on income. How much does it actually cost? How can I get merit aid? What are the best student loans? 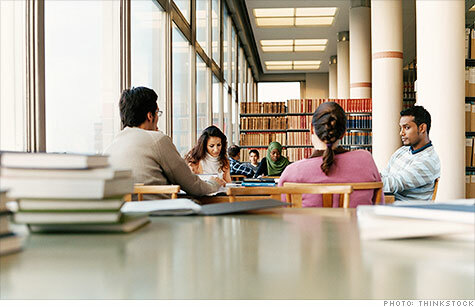 What's the best way for you to save for college? What is the best 529 savings plan for you? Under the present terms of the 4-year-old Income-Based Repayment Plan, graduates who enroll get charged 15% of their monthly discretionary income to pay off loans. All debt is forgiven after 25 years. Currently, the program has 700,000 participants, according to Secretary of Education Arne Duncan. But the administration believes millions more could benefit from the capped loan payments. President Obama directed the education agency to create a new way to allow students to enroll into the income-based loan program online, with a single click. Graduates will be able to upload financial data directly from the IRS -- instead of filling out an application with information from a personal income tax filing. Currently, students can only enroll in the program by first contacting student loan servicers, and the process can take up to six weeks, education experts say. This new move, to go into effect later this fall, would allow students to bypass servicers to enroll on their own, via the Web. "We have a long way to go," Duncan said. "Just by making the process much less complicated and more simple, we'll hopefully see many more of our folks take advantage of this going forward." For those enrolled in the program, the monthly payments are based on income higher than 150% of the poverty line. For a graduate living alone, the payments would be 15% of any income above $16,335, based on the 2011 poverty line. Unemployed graduates with no income owe no monthly payments on their student loans, education experts say. Education officials said it's unclear how many people could benefit. It's not a great fit for borrowers with decent-paying jobs, as the program lengthens the life of the loan from 10 to 25 years, tacking on more years of interest. But for some of the 5.4 million student loan borrowers that the New York Federal Reserve says are late on at least one payment, the program could be a lifesaver. "It's very good news that the enrollment process will be simplified," said Lauren Asher, president of the Institute for College Access & Success. "But much more needs to be done to make sure people are aware that this program can help them." Student loans are unique among all loans in that they cannot be discharged in federal bankruptcy court. President Obama has made the financial strain on students and recent graduates a part of his re-election campaign, often calling on Congress to stop student loans from doubling to 6.8% come July 1. Average student loan debt for the graduating class of 2010 at four-year nonprofit colleges was $25,250, including all private and federal loans, according to the Institute for College Access & Success. Some 35 million graduates have student loan debt, which at $904 billion nationwide, stands bigger than outstanding credit card debt. The terms of the income-based repayment program are about to get more generous for loans that will be originated this school year. Thanks to past laws that the Obama administration fast-tracked, monthly payments will be capped at 10% of discretionary income and loan forgiveness kicks in after 20 years on loans taken out this year for future graduates. The White House announcement came the same day Senate Majority Leader Harry Reid offered a new olive branch to Republicans. He suggested a bipartisan way to pay the $6 billion cost of extending 3.4% interest rates for federal student loans to undergraduates another year. Congressional negotiations are ongoing, aides say. Correction: An earlier version of this story gave the incorrect current student loan rate. The correct rate is 3.4%, which would become 6.8% if Congress does not extend the lower rate. Carlos Rodriguez is trying to rid himself of $15,000 in credit card debt, while paying his mortgage and saving for his son's college education. Susan Carson and Laura DeLallo make $225,000 and have half a million in retirement savings, but their sprawling portfolios is proving hard to manage.